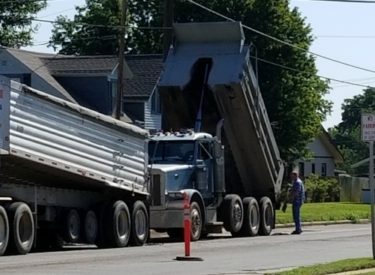 Work crews from Evans and Associates were working Wednesday morning delivering materials for the mill and overlay project at Fourth Street and South Avenue. A project to mill and overlay the asphalt surface on South Avenue, from First Street to Thirteenth Street is underway. The project started in late July. During this project, east/west traffic on South Avenue will be reduced to two lanes and north/south access across South Avenue will be temporarily blocked at some intersections in the immediate areas of construction. The project is being completed by Evans and Associates Construction Company. Drivers are urged to exercise additional caution during the project, especially in the vicinity of workers and equipment.